Whether you’re visiting Morocco for a holiday or to permanently settle here, Kensington Morocco are the Moroccan Property Experts you need. Enjoy your days in the sunshine, lounging by the pool and using the immense space that luxury hotels just don’t offer. Own or rent your dream villa in Marrakech and escape to an awe-inspiring paradise. Marrakech has a reputation for being invigorating to all the senses. Those who holiday and live here will agree that the city allows you to unplug from the rat race while enjoying gratifying amenities and intoxicating comfort. The pulsating Red City is a historic yet modern metropolitan, exuding vibrant culture and unmatched hospitality. Our villas in Marrakech are simply a class above the rest. An ideal locale for singles, couples and families, the city has been consistently ranked as one of the top destinations in the world by TripAdvisor. 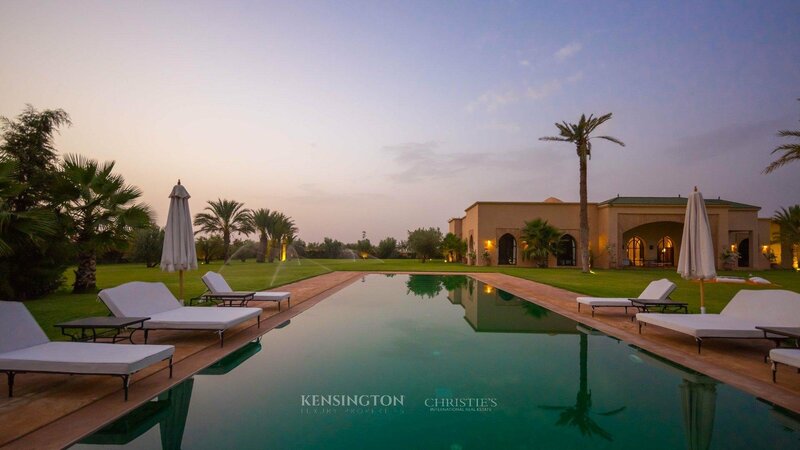 At Kensington Morocco, we are at your service and offer only the very best accommodations as you research villas for sale in Marrakech. Our diverse selection of luxury property buys and rentals in Marrakech and the whole of Morocco have their own distinct charming style, coming standard with lavish amenities and attentive staff with an ambiance that feels incredibly intimate, something that even the top-rated hotels and resorts cannot match. We are also at your service for recommendations for sight-seeing, excursions, fine dining, intoxicating night life, family-friendly activities, and anything else that your heart desires. For the past forty years, in the wake of Yves Saint Laurent and his magic, Marrakech has found a new artistic and architectural renaissance. This modern era offers a new diversified range of developments emphasizing the talent and the knowledge of Moroccan craftsmen and International alike. 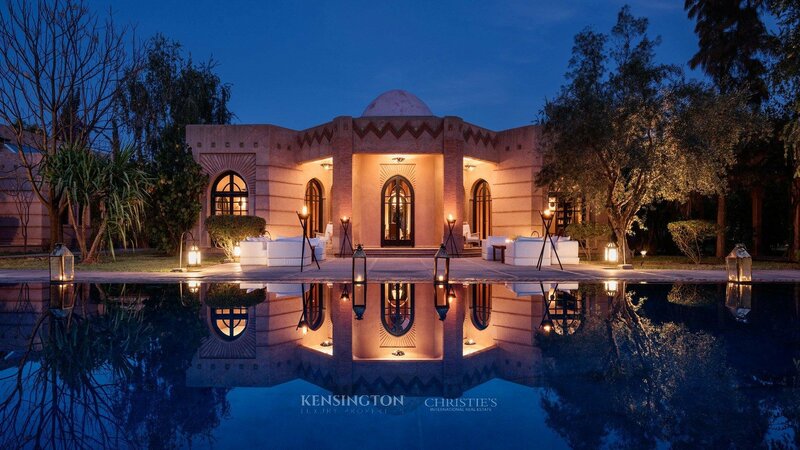 Kensington Luxury Properties, as Christie’s International exclusive affiliate for Morocco, can open the doors to some of the most exceptional Marrakech villa masterpieces this dazzling sanctuary city has to offer. Marrakech is one of the fastest growing and most dynamic property markets you could hope for. Prices are still very affordable and represent a great opportunity, whether you’re investing in a house for yourself or in a commercial concern. There is a stable government and a confident business environment. All year round near perfect climate which enables the possibility of renting your property to holiday makers and reaping a good rental return – in 2014 14m people visited Morocco. The property market has unfairly suffered in the past few years due to the recent turmoil in other North African countries whilst Morocco itself remains safe and secure; now is a good time to invest in villas Marrakech, with property prices well of their highs. Economically the country is doing well, growing at approximately 5% per annum. There is major foreign investment throughout Morocco, breathing life into the country from the new port in Tangier to the world’s largest solar energy farm in the south. All the major international 5-star hotel chains have opened in Marrakech, including The Four Seasons, Oberoi, Mandarin Oriental, Aman and Beechcomer to name a few. There are now 15 luxury golf courses within a few miles of Marrakech, making it a top-notch rival golfing destination to The Algarve and Costa del Sol. Enjoy your access pass to the best Marrakech villas for holiday escape, or as your new home in Morocco’s all-year round, sun-filled climate. Browse through our Marrakech Villas For Sale by searching the filters on the side, and if you can’t find what you’re looking for just give one of our friendly, multi-lingual team a call on +212 5 24 42 22 29, or +212 6 61 55 09 05 and we will help you discover your perfect villa in Marrakech.